The GAMMA 10 tandem mirror at the University of Tsukuba in Japan is the world’s largest tandem-mirror plasma-confinement experimental device. In the future, such a device may use the cooling concept presented in this study by Nathaniel Fisch. Image credit: Teruji Cho, University of Tsukuba Plasma Research Center. Since the development of the hydrogen bomb in the ‘50s, scientists have speculated that the power of fusion might serve as a renewable energy resource. Research has revealed the challenges of this goal, and although nothing close to such an application exists, recently, Professor Nathaniel Fisch from Princeton University has come up with a new idea for efficient fusion energy production based on the old concept of magnetic mirror machines. In fusion, light particles (often hydrogen nuclei) fuse into heavier ions (such as helium nuclei, or alpha particles) and release their excess mass as energy. In order to fuse, the particles must reach a very high temperature (e.g. tens of millions of degrees), transforming into the highly conductive plasma phase. Without any control of the energy being produced, though, continuous chain reactions would result in a massive explosion like the hydrogen bomb. Popular in the ‘70s but in little use today, magnetic mirror machines consist of a magnetic field with high strength at the magnetic axis in the center and low strength on the periphery. This set-up enables confinement of charged particles—and now, as Fisch finds, can allow an efficient method for cooling, which is important for controlled fusion. Fisch explains that his cooling method—called an alpha-channeling effect—is similar to an effect that he and his colleague Professor Jean Marcel Rax predicted in 1992 for use in tokamaks, which are arguably the most popular candidate for producing fusion energy today. Like magnetic mirrors, tokamaks also employ magnetic fields to confine the hot plasmas required for fusion. “In the 1980s, there was a big shoot-out between tokamaks and mirrors,” Fisch explains. “The tokamak concept won out because it simply confined heat better, and now the mirror concept is practically gone within the US. But in the 1980s people just wanted to resolve the ‘proof-of-concept’—whether or not you could bring plasma up to thermonuclear temperatures. The tokamak simply had a better shot at this because it had the better seal on heat and particles. 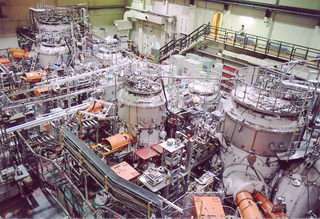 In the cooling scheme, Fisch uses one-meter-long radio frequency waves to control nuclear fusion by cooling the alpha particle byproduct of fusion. This cooling wave resonates with specific alpha particles, cooling them and reducing their energy so that they diffuse to the periphery and quickly exit the machine. The alphas’ lost energy could possibly even heat the remaining hydrogen ions to repeat the process. Fisch’s magnetic mirror idea would allow the alpha particles to travel both perpendicular and parallel to field lines due to the open geometry of mirror machines. Torus-shaped tokamaks, on the other hand, bend the magnetic field lines back on themselves for confinement, prohibiting axial movement of particles. Fisch explains that implementing alpha particle channeling would require two conditions. Because not all particles will be affected by the radio wave (only those with identical resonances), a connection must exist between high energy particles in the center and low energy particles near the periphery so that the center particles have a path of escape. Second, too much energy gain could cause energy losses (e.g. from collisions), but since high energy particles are pulled to the magnetic axis, a particle’s distance to the axis would limit its energy gain. Fisch also predicts that, by arranging for several regions of radio waves at different frequencies, a full range of particles can be cooled and ushered to exit. He estimates that quickening this ash removal process could increase fusion reactivity in certain designs by almost three times by making more room for hydrogen fuel ions. To take the next step and use these ideas in a mirror machine applicable for confining fusion, Fisch cautions that, while there is the potential to improve efficiency using these ideas, the appropriate waves need to be identified in detail. Citation: Fisch, N.J. “Alpha Channeling in Mirror Machines.” Physical Review Letters 97, 225001 (2006).